Description: Straits of Gibraltar also showing Rock of Gibraltar. Coloured. 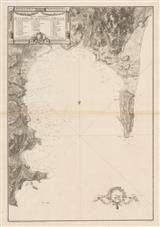 Description: Magnificent chart of the Straits of Gibraltar also known as the legendary Pillars of Hercules by the ancients. Description: Gibraltar. Map and bird's-eye view. Inset map of the Spanish enclave of Ceuta. Original colour. Description: Gibraltar. Several bird's-eye views of city, the harbour, and the fortifications. Original hand-colour. Description: Charming map of Gibraltar with a prominent fleet of British ships in the foreground, both an indication of its importance as the gateway to the Mediterranean and its status as a possession of Great Britain. 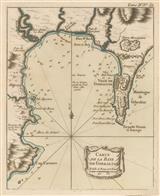 Description: The Bay of Gibraltar as surveyed by Michelot & Bremond. Drawn and engraved by Thomas Kitchen for the London Magazine. Published during the Seven Years' War. Coloured. Description: Map of Gibraltar illustrating the major new works on the promontory due to the importance attached to its position during the Seven Years War. Coloured. Description: Gibraltar. Decorative cartouche. Shows the bay and Rock. Original colour. Description: Large scale military map of Gibraltar illustrating both the land and sea defences of the fortress. 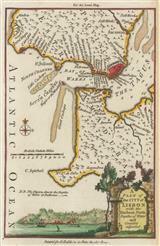 Description: Vintage map of Gibraltar from a survey by the Colonial Service. Printed colour.